This is undoubtedly the most vividly traditional building. Built entirely of stone it is pleasantly illuminated by the gaps between the bricks (fixed in a slanting-superimposed structure), characteristic of this type of rustic building. Daylight pours through the ample windows in the brickwork, whose geometrical structure doesn't compromise the gorgeous view enjoyed through them. The structure comprises two levels, with the bedroom located on the upper level. Both levels are air conditioned. Huge wrought-iron glass doors define the entry to the building. Upon crossing the threshold, entry is made to the living room outfitted with a divan, TV set and dining area. The fireplace wall separates this area from the kitchen, equipped with modern stove and electric appliances. A stone staircase leads to the bedroom, whose cherry-wood parquet flooring conveys a feeling of warmth and coziness. Thanks to the ample width of the room, an additional bed can be accommodated. The Spazzavento Mansion is located on the renowned hills of the Tuscan countryside, surrounded by woods, olive groves, and vineyards, a few minutes' drive from Firenze (Florence locality Scandicci), bordering on the environmentally protected area Poggio Valicaia. Plentiful opportunities for walking and hiking pass right by the mansion. The accommodations comprise the owners' residences and three comfortable, neat double-rooms inside which every detail is the result of attentive care. The Mansion sits in an area blessed by the marriage of culture and nature: you can enjoy relaxing walks along white country paths, long bike jaunts along vineyards and olive groves, bracing horseback riding and relishing the region's celebrated great wines, extra-virgin olive oil, meat, and cheese. Within 10 minutes you can reach the center of Florence where all needs for culture will be satisfied. suitable accomodation for couples or families : The mansion 'Spazzavento' offers three stylishly renovated apartments of the same size which guarantee the perfect solution for couples or small families who want to spend a vacation together, but each with its own space. We had the loveliest time at Gabriele and Simone’s property. They, and their father Giancarlo, are attentive yet discreet hosts, who share their gorgeous estate overlooking Florence. The beauty of the place, and of the area, cannot be overstated. It is convenient to Florence, yet away from the bustle of the city; it allows you to relax while being within a quick drive of all you want to see. A (small) car is essential. I can not recommend this property enough; I will definitely be back! Another wonderful stay - yes, we are repeat visitors to the property. Comfortable and clean with great amenities and responsive and sensitive owners on site to deal with any issues which might need addressed: the boiler in our property was not retaining pressure and the matter was swiftly and efficiently rectified. Surroundings encourage rest and relaxation and provide a comforting contrast to the vibrancy of Florence and the other sites. Would recommend without hesitation. Good food and drink shopping facilities within a very short drive ( a car is essential) - and the convenient nearby tram stop to Florence is a boon. We stayed in one of 3 modern conversions of barns and other outbuildings attached to a grand house in stunning gardens and olive groves overlooking the suburbs of Florence. The apartment was very well equipped with all the mod cons including aircon, dishwasher, washing machine, wifi, etc. but all wrapped in a perfectly restored stone building. The family who own the property were very kind and accommodating and happy to provide us with information on local restaurants and attractions. There are 3 or 4 restaurants within 5 minutes drive (we would highly recommend Poggio il Masseto), and a main town Scandicci within 10 minutes drive with supermarkets and major transport links including a tram into the centre of Florence - removes all the hassle of parking in the city. Around the property are various walking routes into protected woodland and hills which were very pleasant and an opportunity to find local wildlife including deer and potentially more exotic beasts. In summary would highly recommend this accommodation for a quiet out of town retreat with easy connections to local tourist hot-spots including Florence (15 mins), Pisa (1 hour), Volterra (1.5 hours) and much more. Die FeWo ist sehr hochwertig, liebevoll und geschmackvoll ausgestattet. Von der eigenen Terrasse und dem wunderbar gepflegten Garten hat man einen direkten Blick auf Florenz, das man mit der Straßenbahn ganz einfach in ca. 10-15 Minuten erreichen kann. Sehr gute Ausgangslage für Ausflüge in die Toskana. Der Vermieter ist sehr nett, wir bekamen zur Begrüßung gleich Tomaten + Gurken aus dem Garten und eine Flasche Wein. Wir haben uns sehr wohl gefühlt und können diese Ferienwohnung nur wärmstens weiterempfehlen. Wir bewohnten bei Familie Galetti das Bruchsteinhaus, dieses kleine Eckhäuschen ist sehr geschmackvoll eingerichtet und für 2 Personen bestens geeignet. Die Brüder Galetti sind sehr gastfreundlich und hilfsbereit, der Vater überraschte uns mit seinem Wein, Gemüse und Olivenöl aus eigener Produktion. Die Lage des Hauses, ca 4 km, bergauf, außerhalb von Scandicci ist traumhaft, der weite Blick über die Toskana mit ihren Weinbergen, Olivenhainen und den Zypressen, der Blick auf Florenz und den Dom einfach phantastisch. Das ganze Anwesen wird sehr gepflegt und die Ruhe nach allen Ausflügen tut unendlich gut. Siena - Arezzo - Pisa - Lucca - San Gimignano und das Meer bei Livorno erreicht man alles in ca 60 - 80 Min. Florenz ist vom Parkplatz Supermarkt Scandicci gut mit der Linie T1 zu erreichen. Das Anwesen Galetti war nicht einfach zu finden, da man das Haus nicht in der mitgeteilten Straße findet, deshalb früh genug Gabriele anrufen!!! - er hilft. Fazit: Wir waren nicht zum letzten mal in der Toskana und das Haus der Familie Galetti ist immer eine Reise wert. 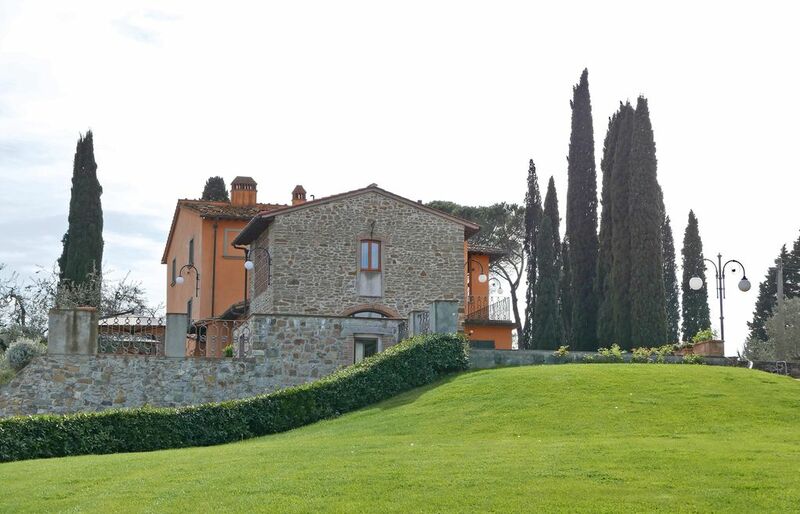 The mansion 'Spazzavento' is located in Scandicci, urban district of Florence and just 10 minutes distance from the historical center of this beautiful Tuscan city. You can enjoy relaxing walks along white country paths, long bike jaunts along vineyards and olive groves and bracing horseback riding. Being just 7km from the highway A1 allows you to organize daytrips to Siena, San Gimignano, Arezzo and Viareggio which is right at the seaside called 'Versilia'. Die Preise verstehen sich für zwei Personen pro Woche. €100 Zuschlag für eine oder zwei Personen mehr. Für Wochenendpreise oder Wochenteilpreise setzen Sie sich bitte persönlich mit uns in Verbindung. Die Woche beginnt und endet am Samstag, der Mindestaufenthalt ist drei Tage. Das Zimmer steht von 16.00 Uhr am Tag der Ankunft bis 10.00 Uhr am Tag der Abfahrt zur Verfügung.